Step inside a world of 19th century elegance and Parisian style at Ladurée Boutique and Tea Salon, which opens this Thursday, March 24th on Robson Street in the heart of Vancouver. Known for creating the world’s most delectable macarons, the celebrated French pâtisserie opens its first location in Canada with an exquisite Boutique and Tea Salon. It takes its design inspiration from the rich history of Ladurée, which goes back to 1862 when Louis Ernest Ladurée, a man from the southwest of France, opened a bakery on 16 Rue Royale in Paris. Behind a façade much like that of the historic Rue Royale boutique, food lovers can stroll under painted angel-scattered skies to find marble-topped gold counters filled with macarons and pastries. 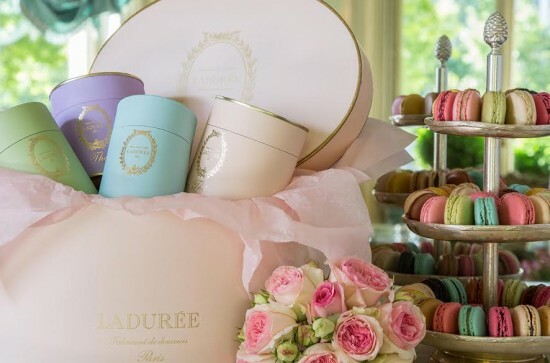 The refined tea salon offers irresistible culinary treats from Ladurée’s chefs and the boutique presents a selection of beautifully boxed macarons, viennoiseries, teas, jams and a collection of perfumed candles and home fragrances. A delicious maple syrup macaron will be offered specially for the Canadian opening. Serving an exclusive menu of sweet and savoury delights, the Tea Salon features beautiful panels depicting the four seasons and Carrara marble-topped cream wooden tables in the bijou salon. Lyre back chairs in rose and almond green hues, and small floral benches, provide comfortable seating for guests. Look out for a special opening treat of a limited edition of Yuko Higuchi macaron gift boxes that were designed for Easter and available until Monday March 28th. Ladurée Tea Salon and Boutique is located at 1141 Robson Street, Vancouver, BC. Open seven days a week, 10am to 9pm. For more information, visit www.laduree.com, or follow on Instagram: @LadureeCanada / #LadureeVancouver.